Whatsapp has upgraded their social media chat feature that talks about two-step verification. This feature was introduced newly for all users on Android, iOS, and Windows. Although, the feature has been functioning for beta testers in the past weeks. So whatsapp, not leaving Android, iOS, and windows users behind, decided to bring in the feature for them to use on their platform. Should in case you don't know the function of the two-step verification on whatsapp. The function helps users or their account to be secured against unauthorized persons. It does that by prompting users to input a six digit PIN whenever they want to register their account on another device, probably new one or old as well. 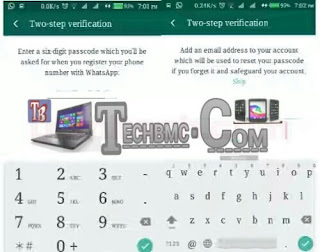 As you can see, the two step verification is very simple and fast to keep your whatsapp chat account safe, unlike when you have to receive traditional SMS which is on use before the introduction of this new feature. Your security matters a lot, even as this new feature is introduced to all now, one can still use the platform of SMS for whatsapp confirmation, if you think it is secured at the moment for you. So, that the two step is launched doesn't mean that whatsapp SMS confirmation has been eliminated, take note, it's considered a necessity by Whatsapp developers. They also added an option for users to enter their email account just for email Recovery if in case one lost or forgot his/her 6 digit PIN. Read on to get the steps for implementing this new improvement on whatsapp security feature. 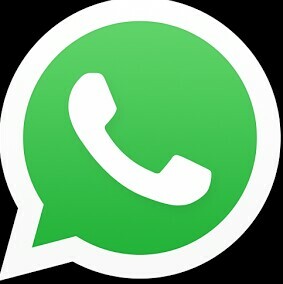 >> First, ensure your WhatsApp social chat app is up to date. >> Then, login into your whatsapp and go to WhatsApp Settings >> account >> Two-step verification and click on where you see Enable. >> Next, you will be required to enter 6 digit pin of your choice, then click on next and re-enter the pin again for confirmation. 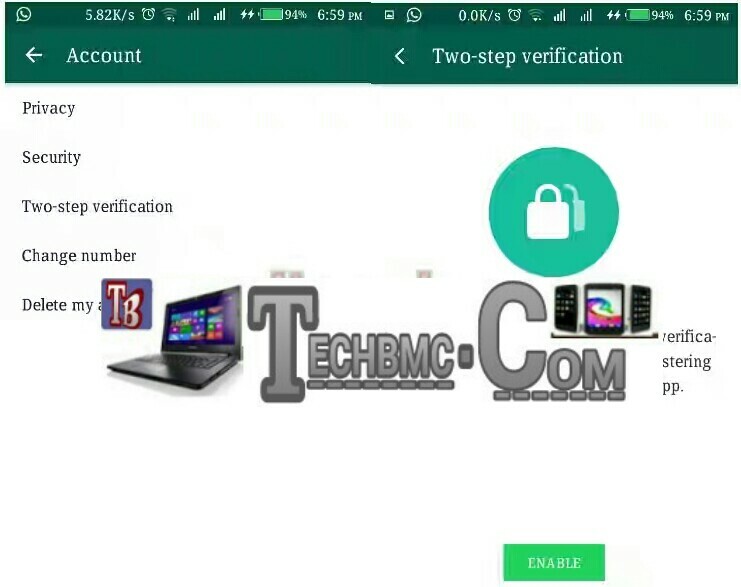 >> If your are done with the above steps, next is to input the email which will be used for email recovery. NB. The email serves as a platform or alternative way in recovering your email in case you wish to reset it because you lost your verification pin. 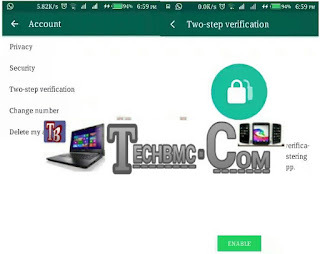 Now, as you are done getting your two-step verification, no one will be able to register your whatsapp account on any other device, unless they have access to your 6 digit PIN. So endeavor to secure your 6 digit pin like your ATM PIN. Got any question or contribution? Kindly use the comment box below, thanks.